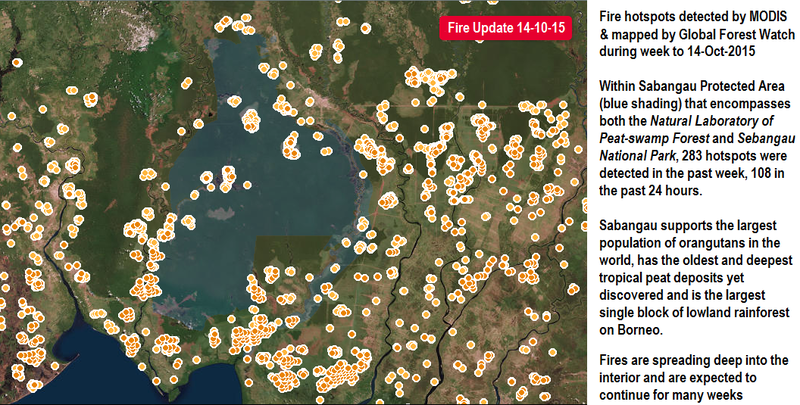 Borneo is burning, yet again. While possibly being the worst year on record, the fires and haze of Indonesia have received surprisingly little international media coverage. The following article will give you a briefing of the situation and what you can do to help. Peatlands and forests are burning across Indonesia. 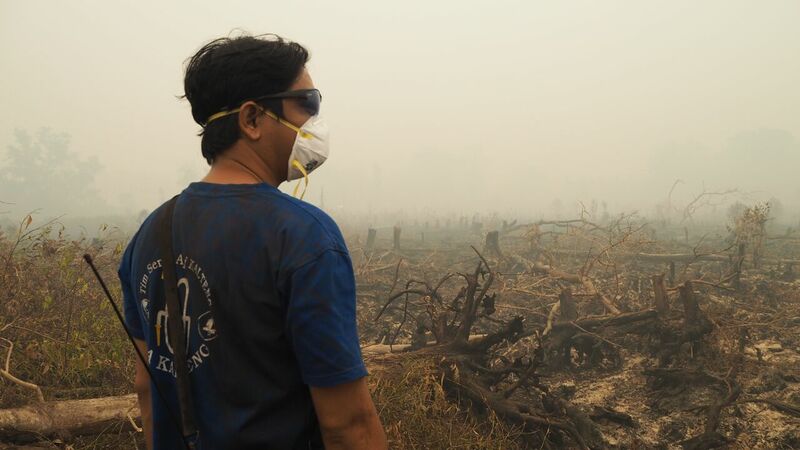 From the 15th of August to the 15th of October, 5,262 fires have raged across the province Central Kalimantan1: one of the areas hardest hit by the fires and smoke haze. Once fires start, especially during drought, they are almost impossible to put out and can burn uncontrollably. In deep peatland areas such as in the Sabangau area, fires burn underground and can continue for months. These fires occur every year, but the problem has been exacerbated by a strong current El Niño weather event which is expected to last into spring 20162. 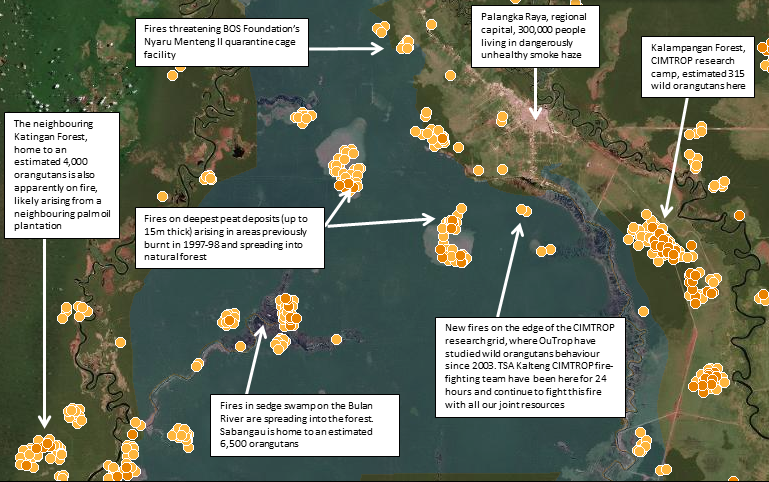 These fires have been started for land clearing (fire is the cheapest method), as weapons in land tenure conflicts, for increased access to rivers for fishing as well as accidentally. Palm oil plantations as well as smallholder farmers are the main contributors to the crisis. These fires are threatening the Sabangau Forest: a tropical peat-swamp forest located in Central Kalimantan, Indonesian Borneo. The Sabangau Forest is the largest remaining area of lowland forest in Borneo. It is home to the world’s largest remaining orangutan population. It is also home to other globally threatened and endangered wildlife such as the southern Bornean gibbon, Storm’s stork and clouded leopard. Indonesia’s peat forests contain vast amounts of carbon. Every day, the fires have been releasing carbon emissions equal to New York City’s emissions for an entire year3. Fires have caused a hazardous smoke haze covering Indonesia, Malaysia and Singapore for the past months. The capital of Central Kalimantan, Palangkaraya, experienced PSI levels (a measure of air quality) of 2,3004. This was the highest in the world, with anything above 300 considered hazardous (healthy levels range from 0-50). People are getting sick and are dying due to the smoke haze. Following the disastrous 1997 fires an estimated 20 million people in Indonesia suffered from respiratory problems, with 19,800-48,100 premature mortalities5. We will see numbers like this again this year. Do you care about wildlife, forests, climate, people? These fires are a catastrophe for all of the above. Locally-led teams are spearheading fire-fighting efforts on the ground, like the CIMTROP Community Patrol Team, which works to protect the Natural Laboratory of Peat-Swamp Forest in the north of the Sabangau Forest and is supported by OuTrop (The Orangutan Tropical Peatland Project). Donate to support OuTrop’s firefighting campaign here. Spread the word! Please, use your social media to make your friends, families and colleagues aware of the situation. Organise fundraisers, donate or just talk to people around you about what is happening and what will continue to happen for years to come if effective solutions are not found. What is El Nino and why is it linked to Indonesia’s fires? Updates and forecasts on El Niño status can be found here.